Despite the provocative session titles, few speakers were willing to admit that either a race or a competition was under way in the GNSS world. Indeed, one way of looking at the Summit’s premise is that the United States already won both the race and the competition in late 1993 with a declaration of initial operational capability (IOC) and 24 operational GPS satellites on orbit. The Russian Federation came in second in 1995. But within the conference’s dozen panel discussions and inevitable hallway conversations lurked many indications that the race continues and the competition is fierce. China squeezed out a few additional details on its implementation plans, announcing that three more Compass satellites would be launched this year, including one in the first half of 2009, and seven in 2010. Russia announced its decision to put CDMA signals on the new GLONASS civil L3 band centered at 1208 MHz. Galileo representatives put a brave face on a program that continues to encounter adversity at home and abroad. As did U.S. officials for a GPS program that has had nearly a yearlong halt in its launch schedule due to a questionable component in the Delta II rocket, and now may have encountered new problems in the next-generation Block IIF satellites. 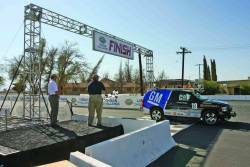 Despite the denials of competition, a race of sorts is being run in the GNSS world. What kind of race? Arguably, it’s a marathon. All of the programs have planning processes under way that reach to 2020 or beyond. Other aspects of the situation, however, give the impression of a sack race, with two or more GNSS providers running in tandem under bilateral and multilateral accords, each with one leg in the same sack. Or within a few years it could even be likened to leapfrog as each round of system modernization propels a GNSS provider temporarily to the front of the pack. GLONASS. In some ways, the GLONASS program — after an allocation of more than 100 billion rubles (nearly $3 billion) in funding for its 2002–2011 modernization effort — has progressed most steadily in recent years. With the three newest satellites from a launch last December now in operation, GLONASS has a 20-bird constellation — including 19 modernized space vehicles (SVs), the most in more than a decade. Some 17 of the spacecraft are broadcasting a second full civil signal on the GLONASS L2 frequency, the only such GNSS system doing so. Its signal-in-space user range error (URE) is down to 1.8 meters — still high compared to GPS’s 1-meter URE, but within the 3.7 meters called for in the GLONASS Interface Control Document (ICD) and several times better than the UREs of just year ago. By the end of last year, GLONASS was typically providing a standalone receiver with five-meter positioning accuracy using pseudoranges. Launches have taken place regularly as scheduled over the past few years, and another six satellites are set to go up in triple launches in October and December this year. If successful, that should bring the GLONASS constellation to full operational capability (FOC) with 24 satellites early in 2010. But that’s not all. The next-generation GLONASS-K will begin launching next year and include a CDMA (code division multiple access) signal on L3, which will more closely align with other GNSS systems that the system’s legacy frequency division multiple access (FDMA) design. A decision about new GLONASS signals at the L1C and L5 frequencies depends on negotiations by a U.S./Russia working group, but could lead to additional CDMA signals, said Sergey Revnivykh, deputy director of the Russian space agency’s Mission Control Center. The stable progress in rebuilding and modernizing GLONASS has even drawn interest from players in the mobile phone industry. Nokia has been investigating the use of GLONASS for its handsets. And, at the Munich summit, Frank van Diggelen, technical director and chief navigation officer for Broadcom Corporation, a semiconductor company that targets mobile handset manufacturers, appeared to compare GLONASS’s prospects favorably to Galileo. COMPASS. As for Compass, if China executes its currently announced schedule for satellite launches, it would mark a substantial acceleration in that program. Given the caution with which Chinese officials have announced their plans, the 10 satellites in two years commitment could well be met. Indeed, a Chinese representative indicated that the Compass program is under pressure from Beijing to show progress in bringing the planned five civil and five restricted services online. The schedule also suggests that China has a lot of satellites already built and ready to fly soon. Autonomous positioning accuracy for the open service is expected to be at least 10 meters, according to Jing Guifei, chief of the international cooperation division in the National Remote Sensing Center of China (NRSCC). A wide area differential service providing one-meter real-time positioning and a short message service (SMS) is also part of the Compass program, Jing said. Yin stressed that GNSS should not be a “competitive” exercise. “We need coordination among system providers,” he said. Although a “regional” capability is expected once the first 10 Compass satellites are in place, Yin said a global Compass service would not arrive until between 2015 and 2020. GPS. As the leading GNSS provider, the United States might be thought to have the luxury of improving on a real and existing system with 31 operational SVs on orbit. In fact, the GPS program is in the midst of a full-blown modernization phase. Launch of a modernized GPS Block IIR satellite — SV IIR-20(M) — is scheduled for March 24, the first since discovery of a faulty component in the Delta 2 booster last June led to a suspension of launches. A demonstration payload for the new L5 civil signal is on the IIR-20(M), and faces an August 2009 deadline to meet an International Telecommunications Union requirement for securing primary GPS access to the frequency. The last IIR-M should go up in August, according to Col. Dave Buckman, PNT command lead for Air Force Space Command at Peterson Air Force Base, Colorado. Launch of the first Block IIF spacecraft is scheduled for October 2009, although anomalies discovered in the signal generator of the second IIF now under construction has introduced some uncertainty into the plan. GPS produced a one-meter URE in 2008, Buckman said. The GPS III satellites, which will carry the new civil L1C signal, are designed to have a URE that is four times better. Galileo. Turning at last to Europe’s Galileo, the laborious process of contracting out the fully operational capability (FOC) system development continues. In Munich, Fotis Karamitsos, European Commission director-general for transport and energy, and Paul Verhoef, head of the Galileo unit, indicated that agreements with companies winning the lead contracts for six work packages should be signed between September and the end of this year. 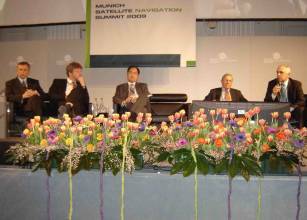 Discussions at the Summit revealed tensions around negotiations with China about a frequency overlay of Compass signals on the security-oriented Public Regulated Service as well as the question of whether the costs to build Galileo can be kept within the €3.4-billion limit agreed by the European Council and the European Parliament. Responding to a comment that “several member states” and private companies have already suggested creating a “light” version of Galileo — fewer services, signals, and/or satellites, Karamitsos said he that the European Union (EU) member states have a “legal obligation to deliver the full system. Galileo satellites will be acquired in blocks of 10, 8, and 8. Karamitsos complained of “people negotiating through the press,” adding, “In this time of economic constraints it doesn’t make sense for our industry to try to make money over” the amount allocated for the program. According to one European source, the reference was to Surrey Satellite Technology Ltd. (SSTL), a UK firm whose acquisition by EADS Astrium closed in January as well as EU members uninterested in using the PRS. SSTL, which specializes in smaller, economical satellite designs, built Galileo’s GIOVE-A satellite now in orbit. SSTL, along with its bidding partner OHB System AG (OHB), has been short-listed as a candidate for the Galileo FOC space segment (with EADS as the other contender) and are preparing for the submission of a “refined proposal” to the European Space Agency. Versus Compass. Meanwhile, the issue of the Compass/Galileo signal overlay — which recalls an earlier attempt to overlay the PRS on the GPS M-code — continues unresolved after two meetings between Chinese and EC representatives. Some years ago, China attempted unsuccessfully to gain access to the encrypted PRS, which requires unanimous agreement of EU member states before a non-EU nation can do that. China’s ambitious launch schedule, which requires final decisions on Compass’s frequency plan, increases the urgency of the dialog. “We hope to get agreement [with Galileo] before we launch, but we cannot wait to do the validation and development of the system,” Jing said in response to a question from the Munich audience. The situation reflects the ill will that has arisen since the two sides signed agreements in 2003 and 2004 to cooperate on Galileo, including a €200-million Chinese contribution to program development. In the session on competition among GNSS systems, Yin said that China’s industry had found it hard to compete for contracts in the Galileo FOC procurement, even though the nation had allocated €70 million for the in-orbit validation (IOV) phase. “Several IOV cooperation projects could not be implemented smoothly, due to obstacles and barriers,” he added.